Wenaas Multinorm FR High Vis Rain Bib & Brace will guarantee protection against a wide range of hazards. Meeting standards for flame resistance and antistatic protection, waterproofing and high vis; this excellent protective bib features elastic adjustable braces. The reflective striping of this product is also flame retardant, and the bib itself is made from a 100% PU coated polyester fabric. Wenaas FR Waterproof Bib & Brace conforms to: EN ISO 11611, Class 2, EN ISO 11612 standards. Waterproof Microflex fabric ensures your personal comfort and your protection from snow, wind and rain. Zip under double storm flap with press stud fastening. 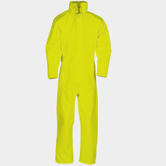 Highly Visible yellow Microflex Waterproof coverall. Fabric: 50% polyamide, 50% polyurethane, 170 g/m². Lyngsoe FR-LR13-56 Microflex HI VIS Coverall conforms to EN343 3:1 standard. Hi Vis Winter Coverall Winter Coverall from Lyngsoe - the market leader, from Denmark. 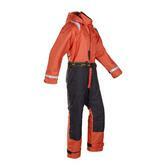 Waterproof Coverall with high frequency welded seams and Zipper under storm flap with press studs. Flame Retardant and AntiStatic Material: 50% Polyamide, 50% Polyurethane, 170 g/m and quilted cotton lining with polyester padding. Multipocket overall includes hood with drawstring, hidden in collar. For more visibility it comes with Hi-Vis 3M reflective tape. Lyngsoe FR-LR33 HiVis Winter Coverall conforms to: EN471 (Hi-Vis), EN14116 (Flame Retardant), EN1149 (anti static), EN343 (Waterproof). Highly waterproof product keeps user dry in most conditions. Manufactured with breathable materials, adding to the users comfort. Articulated knees ensures free hinderless movement. Materials: 68% Polyamide, 32% Polyurathane, LINING: 100% Polyamide. This Portwest Moleskin Coverall is made to meet the hazardous demands of heavy welding or similar tough working environments. It includes heavy duty front stud closure, to provide that extra protection. This coverall comes with one internal chest pocket and two front pockets. There are also two large back pockets with flaps and a ruler pocket. There is also the optional kneepad pockets. Complies to EN ISO 11611 Class 2, A1+A2, EN 1149-5. Manufactured with high frequency welded seams for added support and durability. Secure and comfortable fit with elasticated shoulder straps & buckles. Highly Waterproof to 8000mm of water, keeping the user dry in most conditions. Designed from 50% Polyamide & 50% Polyurethane. Conforms to EN343 & EN471. This waterproof sailing suit not only keeps you dry and warm, but gives you a 70 Newton or 7kg buoyancy lift if you fall overboard. This buoyancy suit is used by rescue crews, coastguard , sailors, and inspection crews, and RIB crews. This Mullion anti exposure suit is windproof, waterproof, breathable, thermal insulating, buoyant and allows your easy movement. The flotation suit guarantees great 180º visibility for the wearer. The hood is extended to fit over a crash helmet. It has resilient reinforced panels added to the front leg, back leg and seat area. Added wind chill resistance - for extreme conditions. Attachment points on the suit make it possible to securely fit a life jacket on top of it. This Classic Rain Suit combines value, practicality and durability in one set. The lightweight two piece suit can be conveniently packed away, easily rolling up to be stored to be at hand when needed. 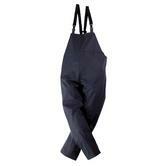 The Sioen Louisiana Bib and Brace Navy Trousers are 100% waterproof and wind-proof. Supple, stretchable, comfortable, lightweight and noiseless. High frequency welded seams ensure extended durability. Made from 100% polyamide knitting with PU coating. A lightweight coverall with a Polyurethane coating that will keep your clothes dry and clean when you have to work in the rain, power-washing or just have to be outside even if the weather is miserable. B-Dry SBDCN Men Weatherproof Coverall Fabric Conforms to EN343 Class 3 Water Penetration and EN343 Class 1 Breathability standards. 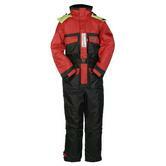 The Mullion 1MHA Waterproof North Sea 1 piece deck suit provides excellent protection against the elements. This suit protects against cold water shock and hypothermia. 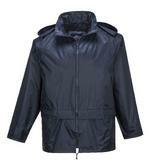 Waterproof outer with taped seams offers waterproof protection. 2 Fleece hand-warmer hip pockets keeps hands warm on those cold winter days. Zipped Napoleon pocket under the storm flap keeps your items safe and dry. Chest pockets with Velcro water repellent flaps offers the wearer quick access to items if needed. Adjustable inner neoprene wrist seals offer a tight secure fit around the wrist area. Insulated high vis hood will keep your head warm and dry as well as visible in low light. Zips in leg cuffs will enable you to pull on this garment without taking off your boots. A perfect product for use on off shore wind farms as well as conventional deck and sailing use. Mullion 1MHA North Sea 1 Waterproof Floatation Safety Deck Suit conforms to EN 343 EN ISO 12402 safety standards. The Sioen 4964 Montreal coverall is 100% waterproof and windproof. Made from Flexothane, these overalls are extra supple, stretchable, comfortable, and lightweight. Excellent protection against protect against liquid splash. 100% polyamide knitting with PU coating. Complies to EN 14605 : 2005 Type 4. Tested to EN 14786 : 2006. EN 343 : 2003 + A1 : 2007 / Class 3-1. Chemtex coverall is 100% waterproof and wind-proof. Made from Extremely strong double sided pvc coated polyester fabric. 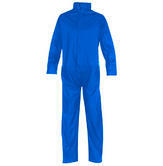 Excellent fitting coverall manufactured in GORE-TEX fabric and has lining for extra warmth and comfort. Adjustable Velcro cuffs knitted storm cuffs, two large side leg pockets with storm flaps and an inner soft collar provide maximum protection from wind and rain. Also allows easy access with lower leg opening with zip closure and Velcro storm flap. The Faithful Kempton overall is ideal for use around the workshop inside or outside as the soft PU coating makes the coverall water resistant and has a concealed hood with draw strings and press stud fastening storm flap. The zips at the bottom of the trousers allow the coverall to be put on and removed without the need to remove your boots. This overall is ideal for use around the workshop or outside as the soft PU coating makes it water resistant. Available in size M only. Thanks to the double-sided PVC-coated polyester fabric, the Essen coverall is perfectly suited for intensive use in industrial environments. The coverall is exceptionally strong and tear-resistant and protects you against chemicals, oil and grease. The fixed hood with peak and the elastic wind cuffs in the sleeves and at the legs offer more than adequate protection. Zip closure under double flap with touch and close fastening and press studs. Chemtex Fabric: Double sided PVC coated polyester 360 g/m². 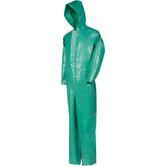 Sioen 5967 Essen Chemtex Coverall conform to: EN 465 : 1995; EN 466 : 1995; EN 343 : 1998 / Class 3-1 standards. Re-usable high tear and abrasion resistant Yellow PVC/Polyester Coverall. Soft and lightweight, Elastomer PVC coated polyester fabric. Excellent Type-4 chemical resistance against many acids and alkalis. Alpha Solway Chemsol Lite garments are manufactured from a softer, more tactile EPVC \ Polyester fabric with additional Anti-static and Flame Retardant properties. 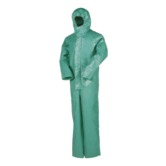 FR Safety Chemical Protective Suit fabric: 75% Elastomer / PVC & 25% Polyester. Alpha Solway CLBH Chemsol Lite Coverall conforms to: BS EN 465:1995 Type 4; EN 1149-1:1996; BS EN 533 Index 1 standards. Lightweight rain-suit in bright orange colour for improved visibility allows you to work in total comfort while protecting from rain and splashes. This full suit is a basic level item designed to protect against the elements, the product offers water resistance to 3000mm. With taped seams throughout & a concealed hood within the jacket collar this is an excellent item for light to medium rain conditions and perfect for outdoor activities as well as work. Dickies WP10050 Vermont Water Resistant Jacket and Trousers fabric: 100% polyester with PVC coating. The clever design combined with flexible material and extreme water resistance, make this overall perfect for power washing and any outdoor task in wet conditions. Premium quality materials, easy access for branding and comfortable fit make this garment an ideal complement for corporate uniforms. This coverall is coated with a perfect blend of PVC and PU. On top of offering outstanding protection against chemicals, oils and greases, it is also flame retardant and antistatic. The Zurich overall is remarkably flexible and comfortable to wear. Zip closure under double flap with touch and close fastening. Sleeve and ankle narrowing by touch & close fastening. Chemflex fabric: 100% polyester knitting with PVC/PU coating 390 g/m². Sioen 6203A Zurich Men FR Coverall conforms to: EN ISO 14116 : 2008 / Index 1/5H/40 EN 1149-5 : 2008 EN 14605 : 2005 + A1 : 2009 Type 3 EN 14605 : 2005 + A1 : 2009 Type 4 EN 343 : 2003 + A1 : 2007 / Class 3-1. Here at Northseaworkwear.com we provide a vast variety of overalls, in this category you can find some of our best waterproof overalls. We only supply the best products from the best brands such as: AlphaSolway, Lyngsoe Workwear, Portwest and Sioen. Waterproof overalls offer complete waterproof protection for anyone working outside. They are perfect for any activities that involve water or mud such as farming, gardening and general work. These Waterproof Overalls are very comfortable manufactured from lightweight materials such as Nylon, Polyester and Polyurethane. The Lyngsoe Workwear LR46-56 is an example of this, manufactured from 50% Polyester & 50% Polyurethane this bib and brace is both comfortable and durable. With a Parachute Clip Fastening system on the Shoulder Straps. Some of these overalls come if a variety of different colours like the Portwest BZ40 which is available in Navy and Orange. 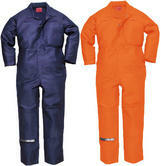 This overall has includes heavy duty front stud closure for a secure and comfortable fit. Not what you?re looking for? Then why not check out our entire Catalogue!